This page offers some guidance on how to use Custom Tags to measure your traffic in new ways and answer certain questions about it. 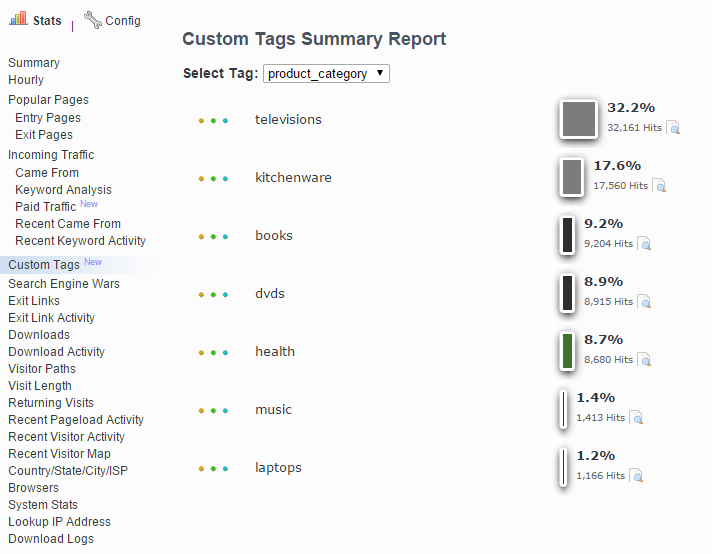 Hopefully it will help you to start measuring new things with Custom Tags, or inspire new ideas of your own! See also: How to Use Custom Tags for some important implementation details. Which authors generate the most traffic? Which blog topics attract the most traffic? Which types of headline attract the most readers? Are long blogs more popular than blogs with lots of images and less text? Which categories of product attract most attention? What was the navigation flow of a user with a specific username or account ID? How can I pass a string like an advertiser ID from the URL into the stats? If you manage a blog with multiple contributors, it may be helpful to measure which authors attract the most readers. Custom Tags can simplify this measurement. Here we will tag our blog posts with an author tag carrying the username of the post’s author. 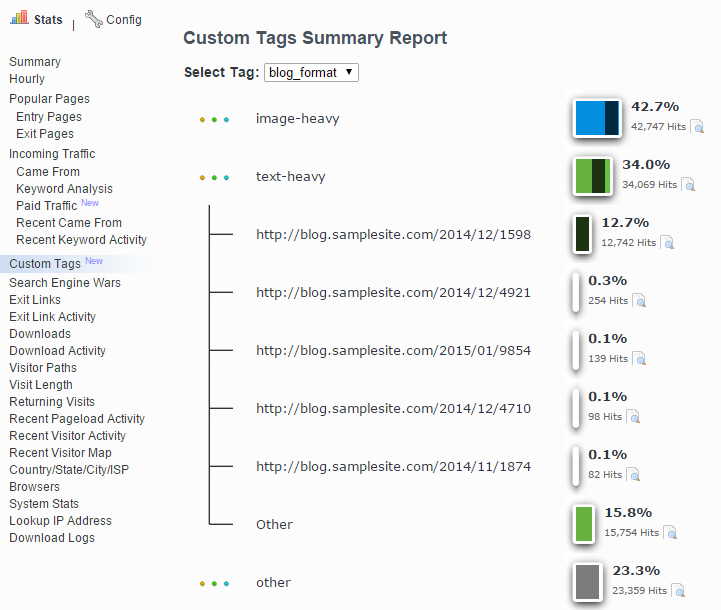 StatCounter will now record the author with each pageview to your blog posts. 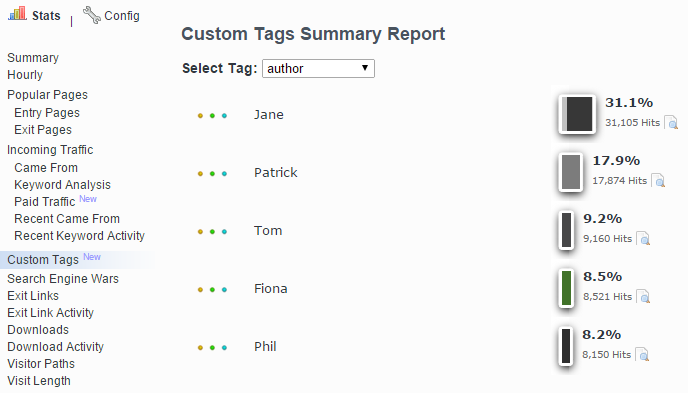 Using the Custom Tag reports you can easily see which author’s posts are attracting the most traffic in total by selecting the ‘author’ tag from the drop down menu. 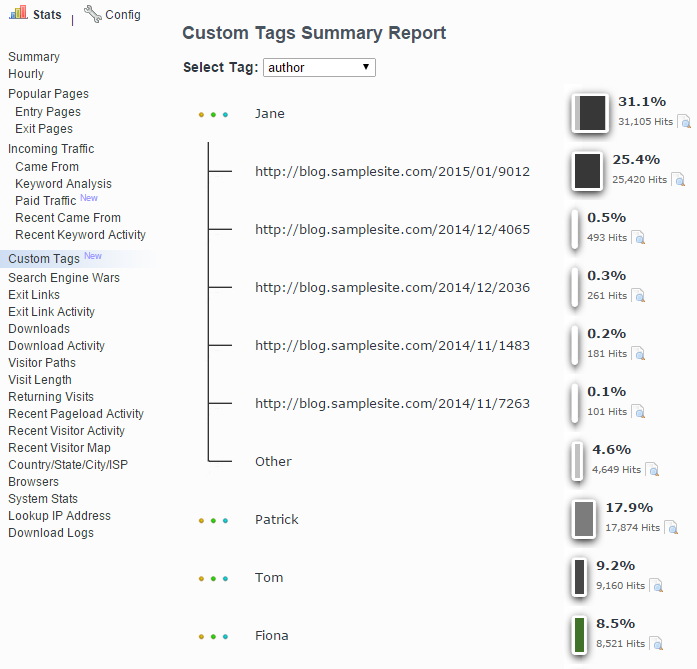 In this case we’ll use a simple topic tag for each of our blog posts. In the above example you can see blog posts on the topic of 'technology' attract most traffic. 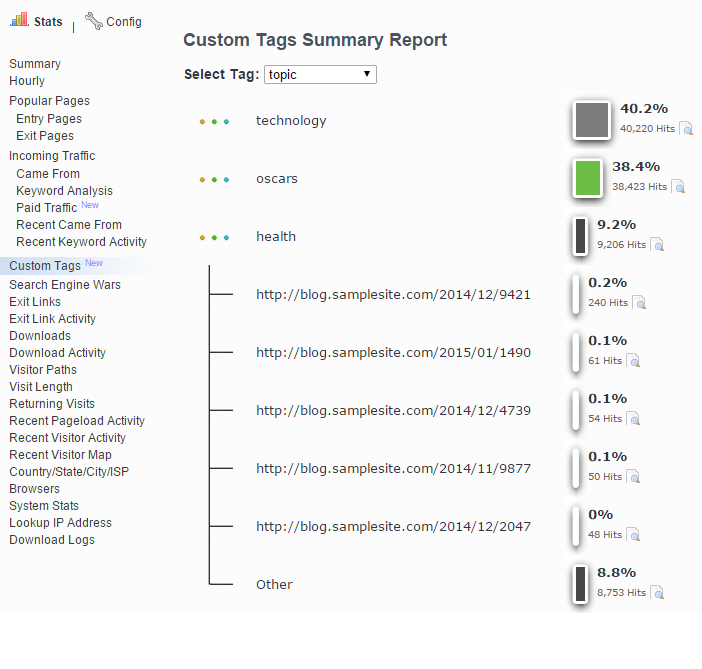 Clicking on a topic in this report - such as 'health' in the above picture - will show you the urls of the top performing blog posts for that topic. Blog headlines can be a key factor in attracting clicks. Tagging your blog posts with the structure or keyword used in a headline could help you optimise what type of headlines perform best with your audience. 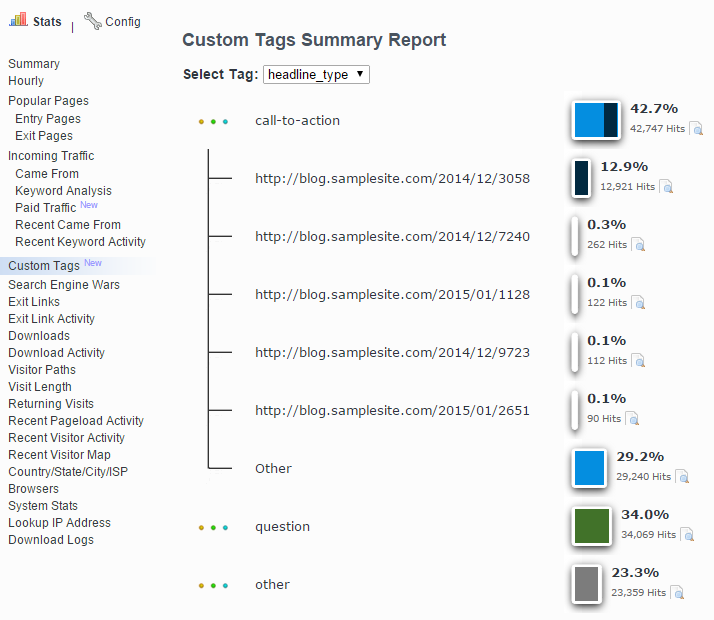 Adding this tag to the relevant blog posts will let you see how they compare in attracting traffic using the Custom Tags report. The presentation of your blog posts and how they perform relative to each other may be something you’d like to measure. Custom Tags can help here. You can now integrate data from your user/account system with StatCounter to allow filtering of your traffic data down to the level of an individual user. Remember, this kind of filtering is available as standard for any tags you specify! To capture certain info from your URL and pass it into the stats please use something like this before your StatCounter code. This code uses a "regular expression" in the bit below to capture an advertiser number from the URL by searching for the text &advertiser= followed by numbers. In the code d* represents a string of numbers. Please note the number after substring needs to be adjusted to accommodate your situation.